4. What and why you think/feel people would benefit from viewing your website and how it relates to the awareness and health of the gut brain and gut instincts. The Second Brain, by Dr. Michael Gershon, MD. In 1998, neurological research at Columbia University published the work of Dr. Michael Gershon that identified the enteric nervous system as a center of feeling-intelligence in the gut, which he called the "Second Brain". Thisfascinating book describes his process and findings. What's Behind Your Belly Button? A Psychological Perspective of the Intelligence of Human Nature and Gut Instinct , by Martha Char Love and Robert W. Sterling. Obviously, we felt it important to add our own book to this important suggested reading list of cutting edge books to help you increase feeling awareness and bring your head and gut intelligencethe two brains to work together for maximum well-being and decision-making. Have you wondered what your gut feelings, your gut instincts are exactly? This book presents a New Gut Psychology and explains exactly what our gut instincts are, and how to access them, and use them to live fully with optimal health. It is written from an overview of 40 years of professional experience by the two authors in developing the use of the Somatic Reflection Process (SRP) to assess and integrate gut feelings, emotional feelings and the logical brain with hundreds of people. A complete protocol of the SRP, which is easy to understand and use, is included in the book. What's Behind Your Belly Button? is an important read for anyone interested in learning to optimize their health and well-being. mBraining: Using Your Multiple Brains to Do Cool Stuff, a book by Marvin Oka and Grant Soosalu is about the enteric and cardiac brains, the neuroscience evidence for them, and the results of two years of behavioral modeling research on the core competencies of the gut and heart brains and how to harness the power of gut instincts and heart wisdom. Increasing Intuitional Intelligence: How the Awareness of Instinctual Gut Feelings Fosters Human Learning, Intuition, and Longevity is written as a companion to Love and Sterling's first book published in 2011, What's Behind Your Belly Button? A Psychological Perspective of the Intelligence of Human Nature and Gut Instinct. It is a response to their readers who have asked them to share more on how the knowledge of uniting Human multiple brains--gut and head--affects current issues in education, wellness and longevity, medicine, relationships and decision-making, and the evolution of mind. You will find Increasing Intuitional Intelligence is divided into five main units that include the following chapters on the affects of consciousness of our gut instincts: 1. Step One to Increasing Intuitional Intelligence! Educating the Gut Brain, Learning, & Childhood Development; 2. Instinctual Awareness and Its Affects Upon Longevity; 3. Gut Feelings and Intuitional Intelligence as Applied to Psychology; 4. How the Consciousness of the Gut as a Brain Affects Religion and Culture; and 5. How Uniting our Multiple Brains Affects Health and Wellness and the Medical Profession. Also availabe on UK Amazon here. Loving your Life! Explorations on loving your self and your life more wondrously using the power of mBIT, Positive Psychology & NLP by Grant Soosalu is an insightful and beautiful heart-centered book that is filled with wisdom we all need to think about and feel into as we make our way through this modern stressful world. I personally experienced that as I read this book, it was a healing process in itself, supporting a positive understanding of the inner self and opening the heart to loving self and others. I recommend this book for everyone, no matter how much inner work you have already done. Grant Soosalu has a way in his writing style of taking some very complex studies and theories in Positive Psychology, Neuro Linguistic Programming and the neuroscience behind Multiple Brain Integration Techniques (mBIT) and synthesizing them into profound wisdom about the intelligence of our three brains that is easy to understand and to begin applying to ones life. Also available on Kindle here. Your Immune Revolution & Healing Your Healing Power , by Toru Abo, MD. Although this book is not directly about the gut or gut instincts, it is an eye opener in that Dr. Abo, a doctor and professor of immunology in Japan, discusses the importance of immune health and stress reduction in general and also in recovering from difficult diseases such as cancer. The understanding we get from reading his work helps us to view ourselves as self-regulatory beings when we listen to the needs of the body-mind and this is the underlying principle for understanding the importance of reflecting on our somatic instinctual gut feelings. He is also the doctor that discovered the T-Cell and discovered the cure for some forms of stomach ulcers. Many people are alive today because of his work. It is worth celebrating that he is also presently working on the cure for cancer. Intuitive Eating: A Revolutionary Program That Works by Elyse Resch, MS, RD, FADA & Evelyn Tribole, MS, RD. This book explains a program to help you create a healthy relationship with food, mind and body. Intuitive eating guides you in listening to your body and honoring your feelings without using food. Visit intuitiveeating.org for more information on Intuitive Eating and for updates on support groups and other resources. Your Gut Feeling: A Formula for Curing the "Incurable" , by Guy Cohen, shares his successful technique used for assisting in self-healing ailments of the gut. Visit Guy Cohen's website and get a free download of a wonderful 17 minute relaxation exercise (an MP3) by Geoffrey Glasborrow to help you heal your bowel and gut region of the body with healing energy and attention. This is the same exercise that lead Guy to heal himself of Ulcerative Colitis by his own efforts. We have ordered it and loved it. Glasborrow's voice on the tape is wonderfully hypnotic. Thank you, Guy, for your generousity in sending out this free of charge to all who need it. Listen to Your Gut: Natural Healing and Dealing with Inflammatory Bowel Disease and Irritable Bowel Syndrome Crohn's Ulcerative Colitis Diverticulosis IBS by Jini Patel Thompson. Jini also healed herself of a devastating gut disease and has devoted her life's work to helping people heal themsleves naturally. Also, be sure and visit her website as it contains a wealth of information on many natural remedies for your colitis, Crohn's, IBS or diverticulitis. Or just read through all her blog articles on alternative medicine and learn how to stay healthy. She is an advocate of being kind to the Second Brain and also offers a free Chapter One of her well-researched and successful book, along with other free material to get you started on gut health. Psychological Co-Morbidities of Physical Illness: A Behavioral Medicine Perspective, Preventive and Behavioral Medicine Publications and Presentations by Dr. Sherry Pagoto (2011) at the Division of Preventive and Behavioral Medicine in the University of Massachusetts Department of Medicine. This is a link to the full text online. Also see chapters within this book: Dr Keefer L, Dr Kiebles JL, Dr Taft TH, on Irritable Bowel Syndrome at the Northwestern University Division of Gastroenterology . European Bibliography of Body-Psychotherapy (EABP): Relevant research papers and books on somatic psychotherapy and health (including entries on gut instinct) can be identified in the EABP Bibliography of Body Psychotherapy - database of about 4,500 entries searchable on-line (unfortunately abstracts only, not original material). You may also make a submission of your somatic research, book, thesis or article here. Stress-Management Through Becoming Aware of Your Gut Instincts, by Martha Char Love. Understanding the twelve keys presented in this article will help you successfully navigate through your awareness of your own gut intelligence and begin to use it as an inner guide to accompany your thinking brain decisions and help you in stress-management. Name of Project: Functional Gastrointestinal Disorders: Psychological characteristics, a study conducted by Wee-Chong, Tan (wee-chong.tan@students.mq.edu.au Phone 0420851485), Dr Andrew Baillie (andrew.baillie@mq.edu.au, 9850 9436) and Associate Professor Michael Jones (Mike.Jones@psy.mq.edu.au, 9850 8601) of the Department of Psychology, Faculty of Human Sciences, Macquarie University. This study is being conducted to meet the requirements for the degree of Doctor of Psychology (Clinical Psychology) under the supervision of Dr Baillie & A/Prof Jones. You are invited to participate in a study of Bowel Symptoms and Stress. Online Survey Study needs participants with gastrointestinal disorders. It is conducted with online surveys. The purpose of the study is to examine how psychological factors such as emotions, personality traits, and beliefs influence long term Constipation and Irritable Bowel Syndrome. We are also interested in examining the impact of these problems on sufferers well-being. This study will help us understand how psychological interventions can be used to help people who suffer from constipation or Irritable Bowel Syndrome. What Are Our Instinctual Gut Feelings? This blog is setup to give a place for the exploration with others of the work that we have done with honoring gut instinctual feelings as a guide for healthy living and the exploration of human nature. Listen to Your Gut. Please is an incredible true story of how a young lady listened to her gut feelings to keep changing doctors until she found one that finally listened to her feelings about her body and it saved her life. When Silence Reigns: Help Yourself Through Expressive/Therapeutic Writing , by Janie Lancaster. Also be sure and visit Janie Lancaster's website where she shares elementary or middle grade lesson plans on emotional intelligence, and classroom ideas, therapeutic writing and poetry, story synopses, excerpts, teachers lesson plans, therapeutic poetry, expressive writing workshops, seminars and media information. 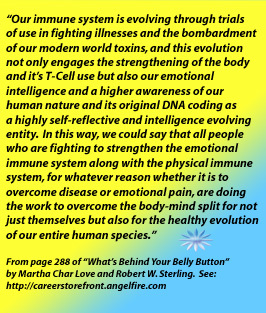 We have on this page a variety of free handouts for classroom or counseling use in exploring gut feelings and the concepts of gut intelligence in our book "What's Behind Your Belly Button?". The Twilight of Sunrise Sunset , by Sandy Steele. This novel was written to inspire couples in America who've lost everything in this economic Great Recession to find happiness. A fascinating read for anyone experiencing hardship and loss to find a hopeful view of the future. To read more on Sandy's self help books, dedicated to helping you learn all about health, hope, love, and positive thinking, be sure and visit her website at http://www.sandysteele.com. Allison Cohen M. A., MFT Practices a specialization in "Intuitive Eating ", (The Non Diet Approach to Healing Ones Relationship with Food & Body). Allison is a psychotherapist working with couples, individuals and young adults dealing with a variety of life issues and is based in Los Angeles, CA., with offices in Tarzana and Beverly Hills. Eclectic Energies: Chakra Test, I Ching, Mudras. Acupressure, Exercises, Articles , a website by author Ewald Berkers. We recommend that you use his website for energy healing for the Enneagram personality types of head, heart, or gut brains; for doing the Enneagram test to find out your type, for experimenting with doing a chakra test to learn the state of your chakras and open the ones necessary using the chakra meditations, learning the acupressure points for emotional well-being (has clear images to demonstrate),and finding books and articles on the subject of one's energetic state. Click Here: now Available on Amazon! The recently published ground-breaking book, Whats Behind Your Belly Button? A Psychological Perspective of the Intelligence of Human Nature and Gut Instinct , explores how using the awareness of our gut responses is successful in improving health through stress-reduction and presents a new Gut Psychology. The clinical experience and research studies of the two authors, Martha C. Love and Robert W. Sterling, demonstrate how when our two centers of intelligent guidance, head brain and gut brain (called in recent medical research at Columbia University as the "Second Brain"), are in balance, they offer greater satisfaction, stress-reduction, and stability to emotional experiences to both individuals and groups in all enterprises of life. The techniques presented may be employed as a healing process to reduce dis-ease and achieve a higher standard of health and satisfaction in our daily lives. When the individual achieves a unity of mind and body and the individuals instinctive inner needs are met with a reduction of stress in the body, both the person and culture benefit from a higher standard of ethics, morality, health and quality of life.